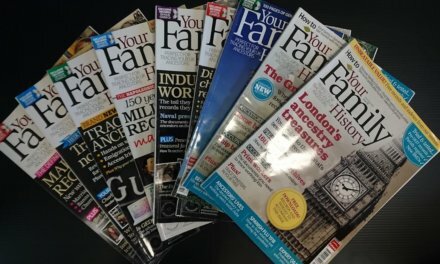 In a scene where we have seen numerous genealogy and history magazine cease publication over the past few years, it is interesting to see a new one start up relatively recently – albeit in a slightly different format. There’s no doubt that the cost of printing is an enormous factor in the cost of production of a magazine, so this newish magazine “Discover Your Ancestors” has chosen to print one big issue (ie. 160 or so pages) once a year, together with issuing smaller smaller emagazine (or periodical as they call it) each month. For those they charge a very affordable cost of £1. Yes, just £1. The printed copy of “Discover Your Ancestors” magazine was launched in 2011, and was very well received at the newsstand, and actually sold out at many retail outlets where it was stocked. And while it is published in the UK, the magazine is available overseas too at newsagents throughout Australia, the United States and Canada (or through their own website if you can’t find a stockist near you). Issue 1 was so popular it is now out of print, but can still get yourself a digital copy through the Discover Your Ancestors website. However they do have Issue 2 and 3 still available in print form, and the prices are £7.99 for the magazine posted within the UK, or £14.99 to be posted anywhere else in the world. 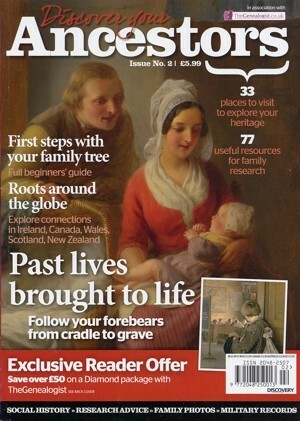 The “Discover Your Ancestors” periodical started in May 2013 and has proved itself to be a high quality monthly digital magazine. It is the online little sister to the annual print edition. It is published 12 times a year at the end of each month, and as with the printed version, you’ll find that it is packed full of stories, case studies, social history articles and research advice, this regular and affordable service is a must have for anyone starting out in family history research, or for those with more experience but who have reached brick walls. With experts guiding readers through various topics, it is a great way to learn while enhancing your knowledge, and it’s really easy to read, too. Available to readers in both PDF and web ready formats, so whether you are viewing on a PC or MAC or mobile device, or you simply wish to print out an article PDF – it is available in the right format for you.